Mini vials of Mysterium Novum perfume for guests to purchase! 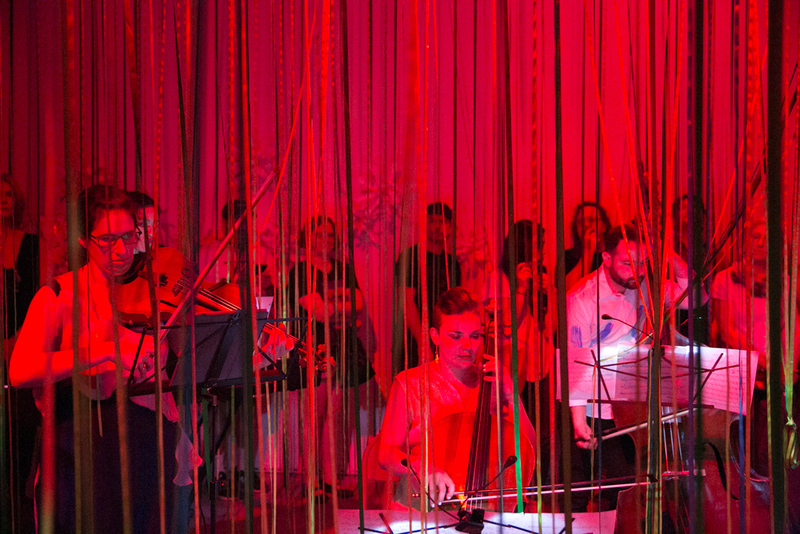 The first performances of Mysterium Novum took place on June 25-26, 2016 at WhiteBox in New York City. The Nouveau Classical Project is a contemporary classical music ensemble "...bringing a refreshing edge to the widely conservative genre" (VICE) and promotes new music to new audiences through a multidisciplinary approach to the concert experience. Led by Artistic Director and Pianist Sugar Vendil, we create compelling concerts through dynamic collaborations. Our roots in working with fashion designers evolved into commissioning a variety of artists in our continual exploration of imaginative ways to present and experience new music. By primarily performing the music of living composers, NCP demonstrates that classical music is still a living, breathing art form. Its performances attract a diverse audience that is becoming today’s most enthusiastic supporters of new music. NCP has performed at exciting venues such as (le) poisson rouge, Galapagos Art Space, Korea Gallery, Symphony Space, The Center for Fiction, and Issue Project Room as part of MATA’s Interval series. Fashion collaborations include CFDA winner Pamela Love, Project Runway winner Gretchen Jones, Kempner Collection, Ecco Domani winner Novis, Tanya Taylor, and more. Our projects are supported by the National Endowment for the Arts (NEA), the New York City Department of Cultural Affairs, New York State Council on the Arts (NYSCA), and other generous foundations and individual donors. Clarinetist Isabel Kim is a member of The Nouveau Classical Project, Hotel Elefant, and Arabesque Winds. She has also performed with the Glens Falls Symphony, This Ambitious Orchestra, Rochester City Ballet, and New York Chamber Virtuosi. She has appeared at the Sanibel Music Festival, Wooster Chamber Music Series, Harry Jacobs Chamber Music Series, Experiments in Opera, Cervantino Festival in Guanajuato, and the River Concert Series; and at venues including Carnegie Hall, Lincoln Center, The Kennedy Center, and (le) poisson rouge. With the Arabesque Winds, she won the Grand Prize at the International Chamber Music Ensemble Competition, Harvard Musical Association’s Arthur Foote Prize, and the Coleman-Saunderson Prize. Isabel holds a Bachelor’s degree from the Eastman School of Music. She is based in New York City and has produced for Symphony Space and WNYC's New Sounds. Sugar Vendil is a New York-based director and pianist lauded for “putting a new face on classical music” (NPR) and “leading the unlikely intersection of classical music and new fashion” (The New York Times). A Filipino-American, Sugar grew up in El Sobrante, CA and holds a Master of Music degree from New York University. She is the founder, artistic director, and pianist of The Nouveau Classical Project (NCP). She was featured as one of Refinery29's "Industry Leaders in the Arts" in 2014. Concerts outside NCP include solo performances for the FLATT Magazine Book 8 launch hosted by Rose McGowan at Tribeca Grand Studios, the Kempner Collection F/W 2015 NYFW presentation at Artbeam, and performances with The Curiosity Cabinet, Hotel Elefant, and Stone Mason Projects. Sugar has expanded her artistic practice to creating and directing hybrid pieces that integrate music, fashion, movement, and other visual elements with NCP, such as “Test Site 1: (In)Habit,” a collaboration with choreographer Coco Karol and composer Trevor Gureckis, which premiered at GK Arts Center in April 2016. Sugar is a 2016 Fellow in the Target Margin Institute for Collaborative Theater Making. Anne Patterson, has created incredibly varied works; from technologically advanced performances such as Mercury Soul at New World Symphony, to productions of Cabaret at Arena Stage, to large scale installations. Her theatrical and symphonic partnerships have included major venues across the United States: Avery Fisher Hall, Arena Stage, The Wilma Theater, The Kennedy Center, Alliance Theater, and prestigious symphonies throughout the country (San Francisco, Atlanta, Philadelphia, Chicago). Anne’s music–inspired installation, Graced With Light, created as the 2013 Artist-in-Residence at Grace Cathedral in San Francisco was extremely popular and featured nearly 20 miles of multi-colored ribbons cascading from the church's vaulted ceiling arches. She has exhibited her paintings and sculptures at Dillon Gallery, Denise Bibro, and Wallspace in New York City; The Shaw Room and Gallery 112 in Atlanta, GA; and the Cade Tompkins Projects in Providence, RI. BA Architecture, Yale University; MFA Set and Costume Design, Slade School of Art, London UK. According to The New York Times, Paul Haas (www.paulhaas.com) “is surely on the brink of a noteworthy career.” Time Out New York calls him a “visionary.” The world premiere of his 80-minute concert event ARCO took place on the opening night of the Park Avenue Armory’s Tune-In Music Festival, ranked by New York’s WQXR as The Top New Music Event of 2011. Haas is the founder and Artistic Director of the critically-acclaimed Sympho, a groundbreaking ensemble that creates live orchestral experiences for the 21st century by placing classical music in new contexts (www.symphoconcerts.org). In October 2013, Haas was commissioned by San Francisco's Grace Cathedral to create a 70-minute musical installation, which was presented in collaboration with artist Anne Patterson's stunning visual textures. And after his first installation (2012) in the Oliver Ranch Foundation's Tower (a monolithic eight-story, 80-foot tall sculpture and performance venue designed by Ann Hamilton in California’s wine country that has hosted concerts by such artistic luminaries as Meredith Monk and the Kronos Quartet), Haas has been singled out as the only artist ever to be re-commissioned by the ORF, creating yet another immersive, site-specific concert experience at the Tower in September 2014. Joel Mellin is a Brooklyn-based multidisciplinary artist whose exploratory career has taken him from NASA space science engineering to studying with the musicians in the remote villages of Bali, Indonesia. He is a visual artist/composer/musician/sound artist/instrument builder. His work has been performed in the US at the Metropolitan Museum of Art (NY), The Smithsonian Institute (DC), the Princeton Festival (NJ), the Chocolate Factory Theater, The Kitchen, Ronald Feldman Gallery, Hartwick College, Adelphi University, and the Gershwin Hotel (NY). Internationally, his work has been featured in the Dublin Fringe and Dance Festivals and with the indie-pop-friendly London-based music label Where It's At Is Where You Are. In 2009, Oakland-based Kolourmeim Press published a limited edition book and companion CD entitled, Compositions For Computer: Volume 1. He is currently the Head of Technology at the NYC-based digital agency Sudden Industries (www.suddenindustries.com). Find out more information about Joel and his various projects at www.joelmellin.com.